There is a limit to what you can write in real time on a blog that your family members are also reading. With this we are, of course, referring to Hurricane Igor! We were sailing near the coast of Labrador when we got the news about the approaching hurricane. We didn't have a lot of time, more or less 24 hours in fact, to seek refuge and get out of its way. Luckily, at the time, we were close enough to Fox Harbour alias St. Lewis, located at the south-east corner of Labrador, to find shelter in its fishing harbour. We arrived here yesterday afternoon and had plenty of time to prepare Sarema for the possible hurricane force winds before nightfall. This was not the first time we had prepared our boat for a hurricane, so we were familiar with the procedure and knew exactly what to do. 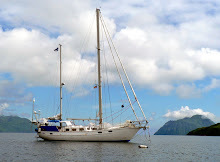 We tied Sarema properly to the wharf, wrapped up her sails, and removed all loose items from the deck. When everything was done, we went inside, enjoyed a scrumptious supper and went to sleep. At the moment, we are having breakfast and listening to St. Johns' radio station describing how Hurricane Igor is devastating most of Newfoundland, just around the corner from us, with heavy rain and winds exceeding 160 km/h, causing flooding, destroying buildings, and washing out roads and bridges. In a way, we have been exceptionally lucky with the weather. Although we have had more than our fair share of headwinds, so far, we have managed to avoid extreme weather conditions. The first time was in St. Paul, the Pribilof Islands, when almost a week-long gale started the same evening we arrived there; after that, in Nome, Alaska, a storm broke out on the Bering Sea a day after our arrival; and now, Hurricane Igor. So, you can imagine how extremely happy we are to be here, in the protected harbour of St. Lewis, all safe and sound. But, apparently, this is not yet the end of the story as we can hear and feel the wind picking up. 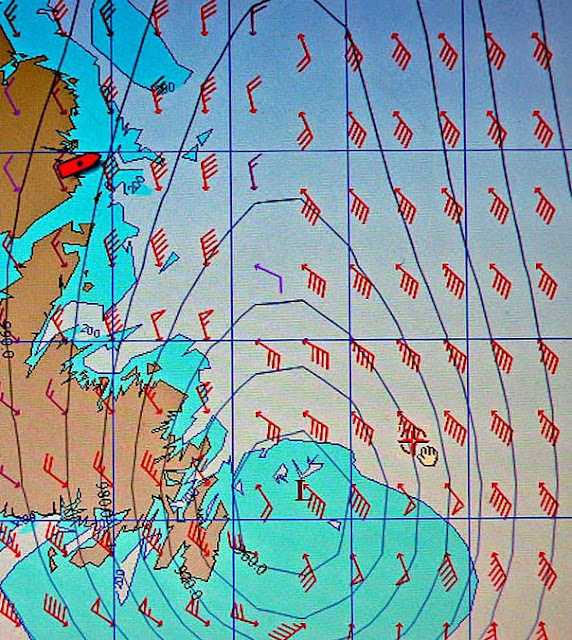 And, according to the latest news, Hurricane Igor is leaving the devastated island of Newfoundland behind it, and is heading for east Labrador!